The 1480 Series Chair allows you the ability to express your personal style through top quality furniture and gives you the freedom to be fashionable and flexible with your furniture design. You can rest assured the construction of each piece is high quality and will last a lifetime. With its exposed wood legs and beautiful rolled arms this Chair will bring a casual elegance and warmth to any of today’s home. Design a fantastic living room with this incredible piece. The 1480 Series Upholstered Chair by Miles Talbott at AHFA in the area. Product availability may vary. Contact us for the most current availability on this product. Fabric Content The ability to use a 100% cotton or cotton blend slipcover can give your room a more casual look for the summer, while warmer richer tones are available for your winter time selection. The 1480 Series offers you the ability to express your personal style through top quality furniture. 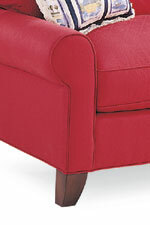 All of your furniture will be hand crafted by an experienced upholsterer to the best of his or her ability. Fully lined skirts, crisp welts, detailed throw pillows and matched patterns are accomplished only by caring hands . . . one at a time. You will especially love how beautiful your home furnishings will look, when you know you have made a smart decision with your purchase. These pieces will be something that lasts a lifetime and builds a warm and inviting home. The 1480 Series collection is a great option if you are looking for Casual furniture in the area. Browse other items in the 1480 Series collection from AHFA in the area.